Job satisfaction is an important aspect of professional life. You can be competitive in your work only if you get the motivation to achieve excellence in whatever you do. However, when it comes to increments, things can go wrong and you may feel that you are being treated in an unfair manner. Many times a firm loses out capable workforce because of bias, workplace politics and wage discrimination. A proper remuneration for your work and effort is the first appreciation any individual desires. If you do not get what you deserve, thoughts like leaving your present job and switching to some other firm may start taking roots. To avoid such instability, you must be able to fight wage discrimination in the workplace. You may have been given a job title at the beginning. As the years pass by, the level of responsibility and challenges you are facing should alter and so should your pay. You as an employee may feel that you are not being valued as an asset within the organization if this doesn’t happen. You need to stick to your role and make sure you do complete justice to it and evaluate your responsibility and the wage you are getting for the effort you put in. If there is a vast discrepancy, speak to your boss regarding the same. Tell them you deserve a better pay for the work you are doing. Make sure to do a thorough research before heading to the management because they will not accept things easily. Tell them why you think you deserve a better pay. Good speakers often manage to put their views in words and get the right thoughts through. So you must definitely put in this effort and make an attempt to convince your management. In a workplace, qualifications and past experience are two things that matter a lot. See whether you have the required qualifications and work related experience. Apart from that, in some fields, frequent updating of skills also plays a vital role. If you are a software developer, you need to be aware of the latest languages in the IT field. Similarly, an SEO executive must know the functioning of the search engines after the latest Google update. If you do not have the latest relevant knowledge, you may not get higher pay even if you have been in the field for years. Networking matters a lot in the job market. If you feel that you deserve to work in a place with a better environment, then you should take part in affinity and networking groups. You will stay updated about the latest job openings in your area of interest. Wage discrimination and workplace politics are often the result of a stable workforce that does not retaliate. If the management feels that discrimination can cause you to look for better opportunities, it will be more alert in attempts to retain you. It will effectively act against discrimination of any kind and ensure that you are rewarded for your efforts. The plus point of joining these groups is that they have members who can offer you with valuable insights regarding issues related to your office. Very often, the workplace discrimination and similar other problems are common in most organisations. You need to know the right way to tackle these problems. Switching jobs only provide some temporary solution. Joining social support networks ensure that you know of other people who have suffered similar problems. They will share their problems as well as their own experience insight on how to solve these problems. These tips help you not just to solve problems but also improve your own management skills. Sometimes, you may not ascend the career ladder simply because you are not made for that field. A professional counsellor can help you find the answers to your problem. There are many community-based employee assistance programs which offer more workable solutions to deal with workplace issues. Some people do not possess the right skill sets to handle higher positions in the firm. Some individuals have language and communication issues that prevent them from making the best out of their subject knowledge. Try to understand whether you lack something. If you need to furnish your skills, invest time and effort to ensure that is done. A job coach can provide you with valuable points which you can present to the management for discrimination related to salary. This, in turn, will help you move up the corporate ladder. While looking for a job coach, check his reputation. There are many fraud individuals who claim themselves to be job coaches but are nowhere when it comes to knowledge. Avoid being cheated and only hire those who seem reliable. Follow the guidelines provided by him devotedly so that you get the desired results. Maintain a detailed note of events if you plan to file a complaint against your manager with the human resources department, union, a legal advisor and/or Equal Employment Opportunity Commission (EEOC). While legal help may yield results, it is a slow procedure. Hence, this should be your last resort after you have tried every other option to get the deserving pay. You need to assess the amount of money you will have to put in to get the right legal assistance. If the difference between the money to be gained and the money to be invested is marginal, it is best not to waste your valuable time on legal procedures. It is easy for a bad remark by either you or an employee to generate bad feelings in the mind of your employer and make the work environment unbearable for you. Think twice before saying something as it can be manipulated by your colleagues. You don’t have to stop being a person you are, but you need to be wise about what needs to be said and what should be left unsaid. The way you present your feelings decides your future in the organization or firm. A wage discrimination at work maybe just a temporary problem that can be resolved in future but a bad impression can never is cured. People often expect an unbiased and impartial approach towards them at the workplace. Yet, they do not apply this principle to their own life and approach. Each of us has been partial towards some individuals at some point of time. This is a natural inclination but make sure that it does not become a habit. Try to be neutral in your approach towards people around you. An impartial and unbiased approach gives you the look of professionalism. The privileges of a good work life cannot be kept away from a true professional for too long. Observe those things which you don’t always see. Some things cannot be checked or proved, but if you ignore any hint of discrimination, your sufferings can aggravate in the long run. If you observe hints of discrimination, it is time you take the right action. If you wait for things to straighten up without doing anything yourself, the situation will simply worsen. You need to be on the alert and look for alternate avenues. Very often, the management may take harsh steps and you need to be prepared for everything. You need to look for other job options. If you are told to resign, it should not be a great blow. 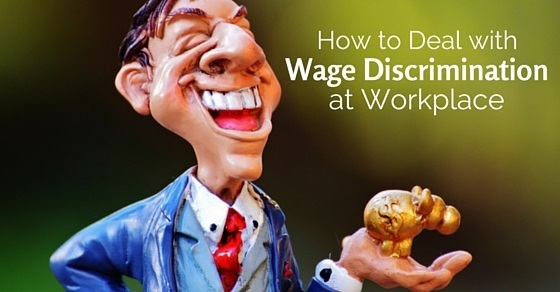 Start preparing alternate avenues even before you present your views regarding wage discrimination. You must also maintain a savings amount for emergency purposes. If you have to stay jobless for a couple of months, you need to have some inventory to manage the expenses. Your personal views regarding spirituality, race, religion and sexual orientation should not affect your ability to observe discrimination at workplace. Nor should it affect your judgment about what is fair and ethical. Sometimes, we assume that the management is being partial and not giving us the deserved wages or fair pay just because we have certain opinions regarding a community or a group of people. Do not have a clouded mind. Such false beliefs may simply ruin your career. Each workplace is governed by a management that includes a group of individuals. Since the management is made up of human beings, there is always a chance of wage discrimination and partiality. You just need to identify such problems and take initiative to solve them. These basic people skills are vital to survive in an organization.